Last time we explored what can happen when there is no effort to actively sustain a change (SPOILER ALERT: it’s not good). 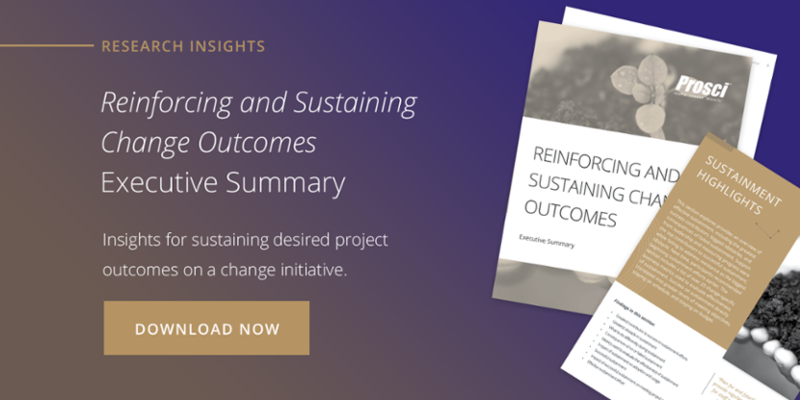 Our research on this topic in the Reinforcing and Sustaining Change Outcomes report highlights several ways that change managers and organizations can successfully plan for and execute sustainment activities. But how do we make sure that our sustainment efforts achieve our goals and make changes stick? How can we make our sustainment effort stick? To answer these questions we are going to turn to the research (page 5 for those of you following along at home) to explore the three deceptively simple top contributors for a successful change initiative. We need leadership support, not only to conduct change management, but also to see it through to the end. Reinforcement takes time, work hours, budget, and a leader standing up and telling the organization that all of this is a necessary part of the change and that their change management work is not over yet. Specific metrics will vary from project to project, but it is crucial to actually measure the progress on the project. How can we know if adoption is successful if we are not measuring it? This step clearly requires some up-front work as well. As a researcher I live by the phrase ‘data is only useful when it is useful.’ It is important to understand what data would be useful before we start measuring anything. Sustainment is a crucial part of most every change management effort and it’s not going to happen on its own. Just like any part of change management work, it requires focused effort to ensure that it is successful.